It stopped me for a moment. There are so many times when I commiserate with other parents about the ways in which our kids tire us out, stretch our patience, and invisibly subsume so much of our lives. On the other hand, we also get to post some really cute pictures. But…why have kids? Let’s put aside any kind of macro evolutionary reason of wanting to keep the species going or the family name alive. What about the day-to-day reasons? For me, I find being a parent a great adventure. It helps me figure out my values, because those are the lessons I look to impart onto my kids. It gives me two more humans that I know – beneath it all – love me, that look to me as their hero and guide and protector. They help remind me of my innocence, so that I am often thrown back into a time when I looked at the world without the layered years of fatigue and sarcasm that I’ve built up as an adult. They keep things exciting. They make me feel smart and needed. They make me feel lost and silly. They make me feel human, and in the end, that really is why I do so much of what I do. This year, Simon turned 8 and Cecily turned 6. Sometimes, I wish they were more mature. Other times, I want to freeze them and prevent from growing another second. I know that’s wrong, of course. Time is a gift and unwrapping it at its natural pace is what gives life meaning. Be extra. Be maximalist. Be the things I’m sometimes scared of being. Comfortably fit in size 34 pants again. Spend as much on causes as on video games. As I’ve moved most of my media judgement to other blog posts in recent years, I’m going to do something a little different for this annual wrap-up; the rest of this post will be a picture from each month of 2018, with a bit of text. 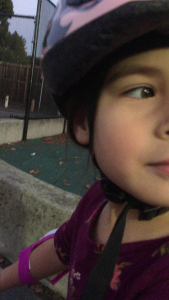 Early in 2018, Cecily learned how to ride her bike, though she has since seemed to prefer a scooter we got Simon last year. A single crash caused her to swear off biking for the time being, which seems appropriate as a child. There are so many things to do – why continue doing something that’s hurt you? Simon decided to wear his “Chinese outfit” when we went up to Berkeley for the Chinese New Year. 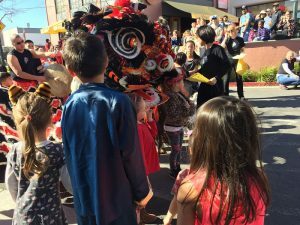 I joke about being a bad Chinese person – I don’t have enough cultural knowledge and I sometimes feel a bit fake trying to pass it on to my kids. But we’re all trying our best to figure out who we are. 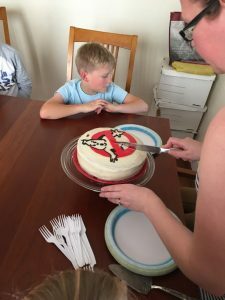 Simon’s birthday party was in March and Katie made a Ghostbusters cake and like everything she touches, it was fabulous. You want to know how I know Katie is magical? It’s because she’ll see something – in a shop, online, in her mind’s eye – and assert that she could make that at home and then, a week later, does it better than the original. 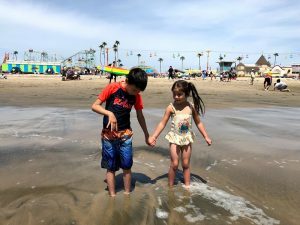 This is a decent picture of the Santa Cruz beach boardwalk, but when the kids hold hands, it makes me melt into goo. For all their arguments, all their moments when they are thoroughly annoyed with each other, there is a deep abiding sibling partnership that is unbreakable. You need to squint (or zoom in) a bit to see the kids, but their roles in Annie as Servant and New Yorker were a smash and hopefully the start of a life of theater geekery. 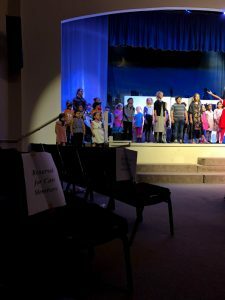 I’m a bit hesitant to try to push my interests on my kids – I want them to follow their own hearts – but theater is different. I will push theater on them forever. 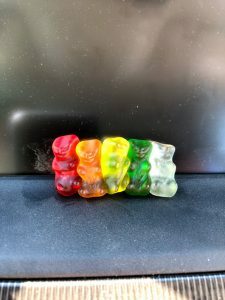 I have way too many vacation pictures from June so instead of choosing one of those, here’s a set of gummy bears we stuck to the dashboard of our rental car in hopes that they would melt together into a rainbow. This was something Katie had remembered her dad doing on some trip many years ago and, as part of the vacation was to an old beloved family cabin (with an outhouse! ), we brought the gummy rainbow back as well. 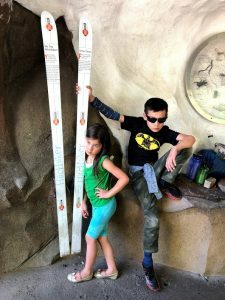 Oh, you know, just bringing that attitude at the Oregon Zoo. Like, who are these children? Where did this come from? Simon and Cecily are legitimately working it here and I feel like that only exists in me hidden beneath mountains of insecurity. The first day of school. 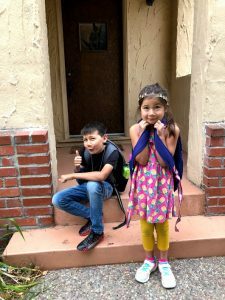 Simon and Cecily are in 3rd and 1st grade this year and are on similar full day schedules. It’s the end of a phase in our family, of course. They spend a decent chunk of each day now outside of our purview and there is a sense of us all having daily responsibilities – work, homework, housework. 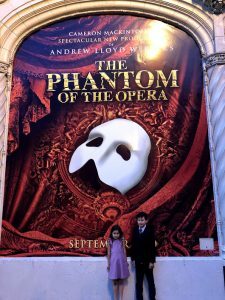 We went to see Phantom as a family. It was a bombastic production and the kids didn’t fall asleep, so we’ll take that as a victory. So much classic musical theater, though: it’s a bit problematic, isn’t it? When am I supposed to start talking to my son about incels? About patriarchy? Is it already too late? 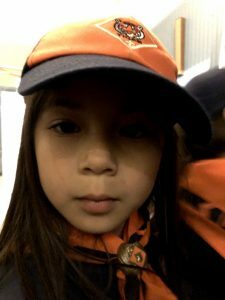 Though she doesn’t look it here, Cecily was overjoyed to start Cub Scouts this year, as the Boy Scouts have become Scouts BSA and are now allowing girls in. Katie has been the den leader for Cecily’s group and she is killing it, y’all. Boy Scouts is another group infused with history from Katie’s family and while I have no connection from my youth, I’m excited to go on this journey with them. One of my favorite places to be at the Oakland Zoo has always been the gibbon exhibit. The apes there loved to swing and put on a show. They seemed like they were living life as best they could in captivity. 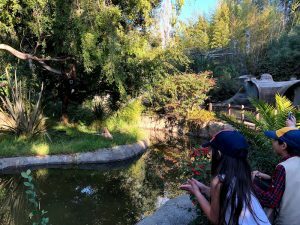 After his mate died a few years ago, the lonely remaining gibbon Nikko was going to be moved to the Santa Barbara Zoo so we went to say goodbye. A few weeks later, he died suddenly after showing initial promising signs of joining his new gibbon family. I know he was just an ape, but this story broke my heart and left me sobbing at work. It made me simultaneously question whether zoos should even exist while also being glad that the Oakland Zoo had brought Nikko into my family’s life. 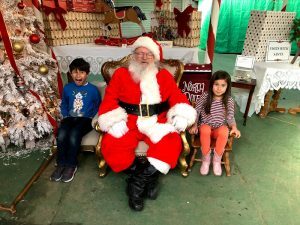 We go to the same tree farm each year to cut down a Christmas tree and visit Santa. The kids both wrote letters to Santa this year, as the children sit in that whimsical window where they’ve learned to write but aren’t too old to think that writing letters to Santa is uncool. We Christmas’d hard this year, maybe because it’s something we had been missing, going to the city to catch a stage rendition of A Christmas Carol and stumbling on the giant tree in Union Square. That’s it. That’s every month. I’ll see you here next year. May your 2019 be bright. Thank you for any 2018 experiences we may have shared.